Crafting for all Seasons new challenge is Beach/Ocean and we got the chance to use some wonderful images from our sponsor for this challenge. Our sponsor for this challenge is Some Odd Girl! I just love me Some Odd Girl images! If you haven't used Kristy's images yet go over to Some Odd Girl and check them out! Kristy has put up the prize of three digital images for the winner of this challenge! I used Surfer Kody as my image for this card. So into the citrus colors right now so I used oranges, lime green and lemon yellows. 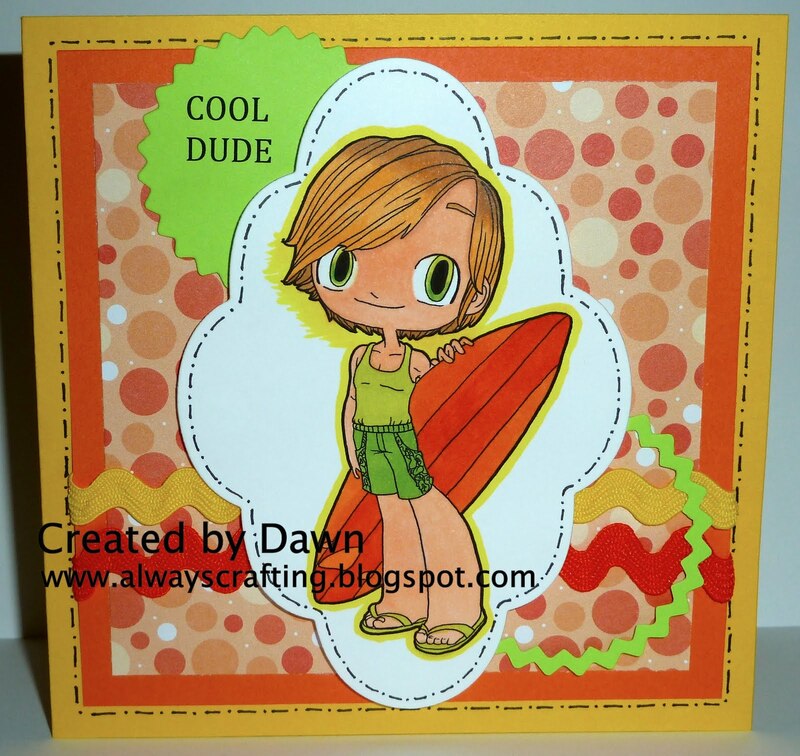 They are great for fun summer cards for boys. Kody is outlined in yellow so it looks like he was standing in the sunlight. His hair had to be sun bleached blond because he spends so much time in the sun. Great summer colors you used. I love this warm, summery card! Your coloring rocks! 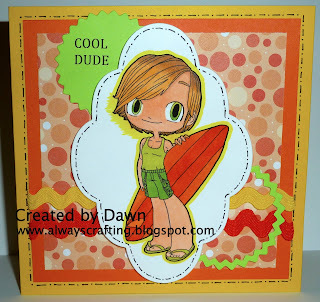 boy this DUDE is extremely cool, and perfect for our Summer challenge at Diva's by Design! Please join us again next time and good luck! You're invited to my 6 month blogversary candy till 8-30! What a bright and wonderful card! Thank you for playing along with us at Papercraft Star! Adorable summer card, Dawn!! Love the fun Polka Dot DP with this sweet image!! Thank you for playing along with us at Whimsie Wednesday Challenge!! Cool card! thanks for playing along on For Fun.